1. This weekend is our first weekend in 4 weeks to not be out of town. I don't remember what it is like to be at our apartment on a Saturday morning. 2. For our anniversary my MIL gave me this great Vera Bradley bag. It will be perfect for our Disney trip. I had no idea other people gave you gifts on your anniversary but I will take it! 3. I watched '16 and pregnant' last night and cried the whole time. They are so many emotions involved in adopting. 4. It is 80 degrees outside. Somebody get me a parka and some earmuffs. I don't know how to handle this. 5. I joined a social site for Mom's about a year ago because they had a message board devoted to gossip about Jon and Kate and I wanted the scoop that bad. 6. I have officially started Harry Potter. Hopefully I like it better than Twilight. So far I do not seem to be a fan of the supernatural world. 7. I have been having the craziest dreams lately. I'm talking weird weird. 8. I am going to try and not eat any sugar during the week and reserve it only for the weekends. This will be the greatest test of self-control EVER. 9. I loved reading all of your comments on yesterday's post. It seems that so many of you were in the same boat as me and we wish that annoying questions would just disappear! 10. Hope you have a great weekend! That bag is SOOO cute! Have a great weekend! I love that new pattern in Vera Bradley. I have an umbrella in that pattern! I can't believe you didn't like Twilight, but I won't judge, haha!! 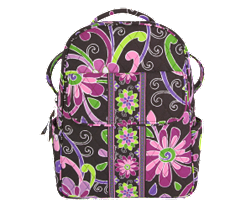 Oh I love the Vera Bradley backpacks. I'm on my third one because I literally wore the others out. Enjoy it! 1) This is the first weekend in 6 weeks that I haven't had to work. I actually have the weekend off!! Whoo-hoo! 2)I love that new pattern. There's another new pattern that I also love (don't know the name). So excited for you that you're going to Disney! 3) I'm a much bigger fan of HP than Twilight. I hope you enjoy it! 4) Good luck on the sugar strike. I wouldn't last, lol. 5) I didn't comment on your post yesterday, but I will now.... I still think you should write that book. I'm single, single and I hate the, "So, when are you going to find a nice man and settle down?" question. I always feel like saying, "When Men R Us has a half off sale." Enjoy your non traveling weekend! You should enjoy Harry Potter more than Twilight. It seems people who are really into one are so-so about the other. :) And I love that Vera pattern! Harry Potter! I've thought about reading those here recently too. So, let us know how it goes. Although, I loved Twilight, btw. yay for a relaxing weekend at home! and i'm still so jealous about your disney trip! wow! 1. I am literally laughing out loud about you joining a mom's group to get the scoop on Jon and Kate! 2. You have a great MIL! 3. I almost called into work this morning just so I could sit out on the back porch and enjoy this amazing weather!!!! Love the bag! We're also excited about a travel-free weekend! I'm thinking tonight is a great night for the fire pit & some smores! i read the hp books and LOVED them! The Harry Potter series is amazing. You won't regret reading them. Cute bag!! I really like it! And have an enjoyable travel-free weekend! I don't have the same luxury this weekend, but it'll be fun none the less! And I wanted to see that "16 and Pregnant" too, but I missed it. I probably would've cried! Haha, the thing about the John and Kate message board is so funny. I love it! I totally cried at the 16 and Pregnant finale, too. We watched 16 and Pregnant too last night! I bawled through the whole thing. It even brought tears to the hubby's eyes. Those two were so brave and I don't think I could have every done what they did. Enjoy your Saturday at home. Sometimes it is nice just to be home. Keep us posted with your thoughts on HP! I am a crazy, kind of obsessed fan and I have been for quite some time. And I read the first Twilight book and just didn't get it. HP on the other hand...I could talk about it for hours!! The weird dreams are probably a result of reading Harry Potter:) I definately love Harry more than the vampires. Be forewarned- the movies are a bit intense (I know you don't like anything scary- like me). what a fun bag! anniversary presents sound like a good deal! cute bag! oh my goodness, i went to pick my friend up the other night for dinner/wicked and she was crying hysterically bc of 16 & pregnant! I've STILL not watched it..not sure I could handle it! !